ePresentment Gateway for Box is the answer to the challenges of quickly and efficiently distributing bills, invoices and other customer-facing documents. ePresentment Gateway for Box manages the transformation of multiple print streams into a web-friendly format for immediate distribution. It uses the Box platform to ensure that the electronic documents are stored and archived in government and industry regulatory compliant repositories. 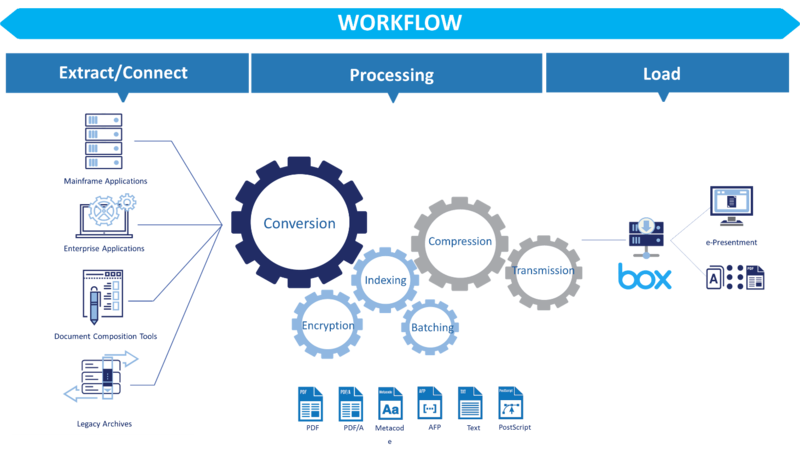 ePresentment Gateway for Box offers universal print-stream archiving and print stream conversion across industries and business applications. It classifies, transforms, indexes, and efficiently stores high-volume documents of almost any kind and supports a wide range of source document formats including AFP, Xerox Metacode, PCL, PostScript and plain text. ePresentment Gateway for Box provides the flexibility to archive in industry standard formats like PDF/A. With Crawford Technologies’ ePresentment Gateway for Box you can consolidate disparate archiving systems, including legacy archives, migrate to platforms that are more cost-effective, and make print and digital streams available to customer service and consumer portals.